Promoter Takes To The Streets Of NY To Ask People Do They Know Who Deontay Wilder Is? One boxing promoter has come up with a unique idea to test how famous the American WBC heavyweight champion really is in his home country. Boxing like all pro sports is publicity driven. Fighters need exposure and publicity in order to ultimately sell tickets and generate TV ratings. WBC heavyweight champion Deontay Wilder will have given his profile a shot in the arm this past weekend following his crushing first round knockout of Bermane Stiverne – but one UK promoter believes there is a lot of work to do on this front. That is of course Wilder rival Anthony Joshua’s promoter Eddie Hearn. Who happens to be in NY this week trying to make the Wilder vs Joshua fight happen. As well as promoting his first US boxing show IN Long Island this Saturday headlined by Danny ‘Miracle Man’ Jacobs. Hearn doesn’t believe Wilder is a big name yet but at the same time mentioned he has been impressed with Wilder’s recent self-promotion. 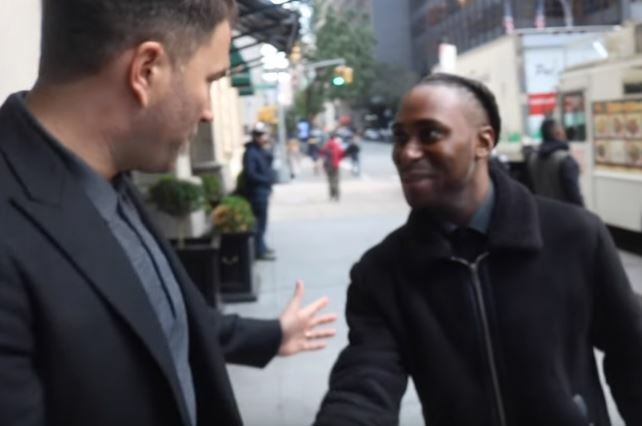 To make his point as clearly as he possibly could, Hearn actually started approaching random people on the street of New York to ask them do they know who WBC heavyweight champion Deontay Wilder actually is.